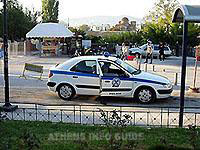 The Athens Tourism Police is an integral part of the Hellenic Police (ELAS) consisting of men and women especially trained to offer tourists information and help whenever they have any problems. They are also competent to solve minor differences between tourists and enterprises. All Athens Tourism Policemen speak foreign languages. You can recognize them by the shoulder flash "Tourism Police" on their uniforms. Tourism Police operates an emergency telephone line on a 24 hour basis. Just dial 171 any day, any time, from all over Greece. The office of the Athens Tourism Police is at 77, Dimitrakopoulou Street, tel. 171 or 210 9242700. As there are tourists in Athens all year long, needless to say the Athens Tourism Police is operational 365 (or 366) days a year. When you have a problem with someone else, do not get into a heated discussion and certainly not in a fight. Just call the Tourism Police. Don't see these policemen as tourist guides because they are not but do address them when you have a question on how to get somewhere or where that place exactly is. They will be happy to help you.